Partnering with sports teams and corporations to achieve sustained success through unparalleled experience and cutting edge optimization approaches. It’s an incredible honor to coach this game, to work with dedicated professionals like Fergus and our coaching staff and to see the growth of young people on and off the field every day. I hope you enjoy your journey to becoming a Game Changer and that once you’ve finished this book, you’re better equipped to win, no matter what game day means for you. Spitting fire! Fergus Connolly takes on the misguided modern movement of big data, measurement and attempting to control every bit of minutia. One of my top 10 coaching books of the year! This is the most real breakdown of what really happens in the locker room and on the field. If you want to be any part of a team sport setting and enjoy learning about science, performance and leadership, this is the book you’ve been looking for. There are few books as widely anticipated as “59 Lessons”. 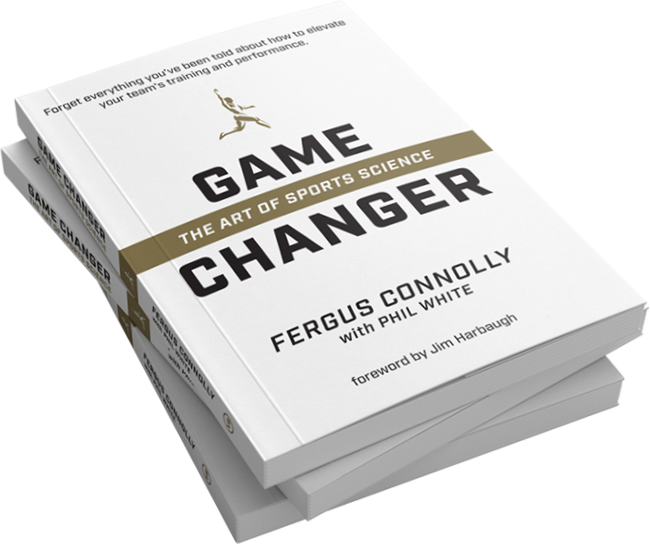 In this, first of it’s kind book – Fergus Connolly shares the secrets he has learned over 20 years from some of the most famous names in sport and military – as well of the special ones you haven’t heard of! ’59 Lessons: Standing on the Shoulders of Giants’ shows you how you can apply these lessons to your life and work – as well as the mistakes to avoid. Dr. Fergus Connolly is one of the world’s foremost human performance thought leaders and influencers, and has applied performance science with leading sports, military, and business teams. He is the only coach to have full times roles in every major sport, including soccer (Liverpool, Bolton Wanderers), professional and college football (San Francisco 49s and University of Michigan) and rugby (Welsh national team). Fergus’s experience can make your team Game Changers. Watch Fergus talk in depth about elite performance concepts with Derek M. Hansen of strengthpowerspeed.com. Read an interview with Fergus in The Guardian as he details the key reasons for Tom Brady’s longevity and sustained success. Listen to Fergus discuss teamwork, dominating the competition and thriving in chaos with Thom Shea on his popular podcast, Unbreakable. Learn the practical application of coaching and performance science. This course is the gives you the ability to turn what you know and have learned into real world results.